What says the law? You will not kill. How does it say it? By killing! I think this country would be much better off if we did not have capital punishment…. We cannot ignore the fact that in recent years a disturbing number of inmates on death row have been exonerated. The Japanese Criminal Justice system is perverse and fundamentally unsound for a long list of reasons. Both foreigners and Japanese nationals have and will continue to suffer within its confines. Japan is also one of only two industrial nations left that maintain the Death Penalty. This is the first hand account of one man who made it out of the nightmare alive…. Sakae Menda, (Japan) is the first Japanese prisoner sentenced to death to be freed from death row. Mr. Menda was arrested with three others in 1949 for a double homicide he did not commit. He was tortured and had an unfair trial, but was condemned to death. Determined to prove his innocence, Mr. Menda sought a retrial six times in the course of his time on death row. In 1983, after 34 years in prison, Mr Menda was successfully granted a re-trial at which he was found not guilty. 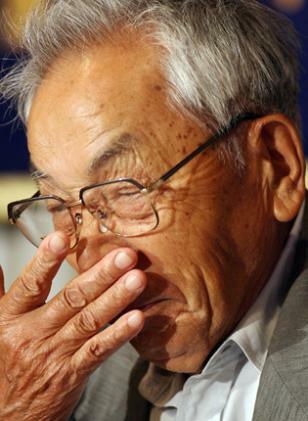 Now aged 81, he is a key figure in Japan in the movement to abolish the death penalty. “I had been sentenced to death because of a murder which I did not commit. From January 1949, I spent 34 years and 6 months, under the weight of a death sentence, in a prison without any freedom. I did plead innocent but it was very difficult at first because I did not have a lawyer. Eventually I was able to obtain a lawyer, and after six petitions for re-trial, the Fukuoka District High Court ruled on the reopening of the case in 1979, and on July 15th 1983 the court delivered the verdict of an acquittal and I was released. “I am the first death row inmate to be found innocent upon retrial in Japan. Since my case, three death row inmates have been found innocent upon retrial and have been released. These three individuals, respectively, had spent around 30 years in confinement as death row inmates. “In Japan, there are a good number of those on death row who claim to have been falsely convicted. However, apart from four of us, so far no one else have been found innocent upon retrial. “I was accused of murdering and /or injuring a family of four in Hitoyoshi City in Kumamoto Prefecture. I had an alibi which was recognised in the retrial, however in the first trial, the investigators had false statements given by a witness, and my alibi was not taken into consideration. There was also physical evidence to prove my alibi, but this was also ignored. “During my interrogation, investigators were divided into three teams, each taking it in turns to interrogate me. Through coercion, extortion, leading questions, and brutal force, they were determined to elicit a “confession”. “When I claimed my alibi, the prosecutor said to me, “Do not lie. The more you lie, the heavier the crime. Tell the truth, and do penance for your crime. You will go to hell so long as you choose to lie.” He was not willing to believe anything I had to say. As I was denying the charges, the prosecutor should have at least investigated the facts. “The prosecutor lent a hand to the investigators doing away with the witness, and I believe I am not going far by saying that he is guilty of a judicial crime. Furthermore, the lawyer only came to see me once before the trial. This lawyer was a Buddhist monk, and took out a beadroll out of his pocket at the time of interview, and promptly left after he finished his prayer. “On March 23, 1950, Judge Haruo Kinoshita rendered the court’s decision sentencing me to death, with a trace of a smile. The given ruling was very simple, and did not mention any physical evidence or witness account that proved my alibi. During my imprisonment, I thought hard about the death penalty. During this time, I saw off 56 inmates off to their end with a handshake at the Fukuoka Detention Center, and these are only the ones that I remember. “Most of them were to some degree unhappy with their trials. There were death row inmates whom had been falsely accused like myself. As I have shaken hands and listened to the last words of all these individuals, I have come to strongly believe in working and acting together with individuals who share an understanding in this cause; to abolish the death penalty so long as there is a danger of falsely convicting the innocent. I heavily sourced this Amnesty International Page while writing this post. Look at their low crime rate and the severity of what few crimes are committed. Still the poor guy….wonder if they have made a movie about it yet? To avoid the stigma of having been arested in an asian society (whether innocent or not) he is going to have to move and change his name. ” Japan is also one of only two industrial nations left that maintain the Death Penalty. ” ? In 2011 the USA was the only G8 country to use the death penalty. Perhaps “Industrial” was the incorrect term. “Leading Economic Nation”. The scene has shifted about now as China is killing all kinds of prisoners and is the second leading economy in the world.